Meet Alicia Diaz, 11-year healthcare veteran and advocate for the Black community who saw the need for nutrition and health awareness and decided to make a change. Diaz, who holds a master’s degree in health education, began conducting research and found Blacks are known for having the highest cases of hypertension, diabetes, and obesity. “As African American people, this is something that is so important because of the health statistics. The thing is obesity, hypertension, diabetes, especially type two, those are preventable. We just have to make the right choices,” said Diaz. After the launch, Diaz began using social media as a way to introduce fitness ideas and healthy nutrition options to the Black community. 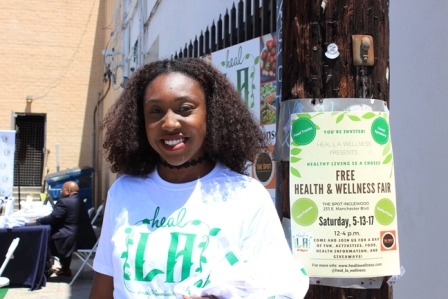 Heal L.A. Wellness held its first free community event in early May at “The Spot,” a Black-owned pop-up space in Inglewood. While there, attendees were able to receive free blood pressure screenings, information on women’s health, and other informational tools on improving one’s mental, spiritual and physical health. “It went really well, people were shocked we were even doing something like that in our community,” said Diaz. The Black community can expect more events similar to the health and wellness fair in the future. Diaz encourages people of all ages to be mindful of their health between annual doctor’s appointments. All of the information published on Heal L.A. Wellness social media pages are from reliable medical sources like the Center for Disease Control. For more information on the organization please visit www.heallawellness.com and follow Heal L.A. Wellness on Facebook @HealLAWellness.